Verna Morales , and her daughter, Aliah, have been homeless since her divorce in 2009. Aliah is a high school sophomore. A resilient economy and low unemployment have done little to stem the tide of students who are finding themselves homeless in Oklahoma. Despite a five-year oil and gas boom and falling jobless rates, growing numbers of youths are finding themselves without a bedroom to call their own – a trend seen across the nation. Tonight, thousands of Oklahoma children will fall asleep on the couches or beds of friends or relatives, according to data reported by school districts to the state. Those adults have no legal obligation to care for the child or their family and can kick them out at any time. Hundreds more will stay in a hotel or motel. Others will sleep in a shelter or on the streets. The surge in homeless students has raised alarms among school officials, lawmakers and child advocates. According to data collected by the Oklahoma Department of Education, the number of homeless students shot up by 43 percent over two years, from 17,539 in the 2011-2012 school year to 25,114 in 2013-2014. Figures for the recent school year are not yet available but are expected to exceed last year’s total, education officials said. The state’s numbers also grew just after the recession of 2007-2009, federal data show. The rising counts spurred a state legislator to author a bill this year that requires the state to gather more precise data on homeless children. The bill, offered by Sen. Kay Floyd, D-Oklahoma City, and signed by the governor in April, will be used to shape future state policies addressing child homelessness. The increase comes as a surprise to many education officials in light of Oklahoma’s economic growth. The reasons for the mounting problem are not clear, although experts point to poverty, drug abuse, teen pregnancy and high rates of incarceration and mental illness as possible factors. The impact on children and families can be traumatic. Aliah Morales, a sophomore in Tulsa Public Schools, has already spent a fifth of her life homeless. She’s been in three foster homes, in and out of homeless shelters six times and was in a mental-health facility for treatment of several disorders. She said she bounced through nine schools her freshman year alone. Morales, 15, is now staying at a Catholic Charities transitional apartment in Tulsa with her mother. She said the instability of homelessness affected her in many ways, including in school. The word “homeless” evokes a gritty life on the streets, but most students categorized as homeless are not living under bridges. Statewide, 76 percent of the 25,114 homeless students last year were “doubled-up” or “couch-surfing” with friends or extended family members. Nearly 14 percent were in shelters, 7 percent were unsheltered and more than 3 percent were in a hotel or motel, state Department of Education data show. Even with a place to stay, these students are essentially adrift, school officials say. Putnam City had 4,042 homeless students in 2013-2014. Of those, 3,841, or 95 percent, were doubled up; 110 were living in a hotel or motel, 68 were in shelters, and 23 were living in a car or outdoors. 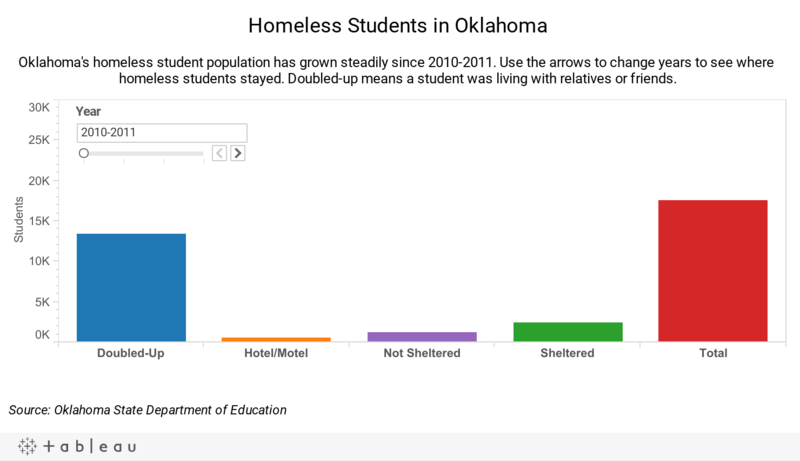 Oklahoma has seen one of the largest increases in homeless students in the nation. Oklahoma City Public Schools has counted 3,200 homeless students so far this year, setting a new record for the district. Also, the numbers are based on data self-reported by parents when they enroll their child. Some may conceal their situation because they’re ashamed or are afraid that they will lose custody of their children. Fragile economic circumstances at home also can mean a family will start the school year with a home, but end up on the street months after classes start. That means teachers or school officials must continue looking for signs that a child is homeless, such as wearing the same clothes every day. Brown said the effects of poverty and homelessness can follow a child into adulthood. “There is a cycle we are trying to break,” she said. Being homeless places students at risk of physical and mental health problems, exploitation and abuse, poor nutrition or hunger, and criminal influences. Homelessness also can impede learning. A child may be more worried about finding the next meal than studying for the next test. About 49 percent of the state’s homeless third graders in Oklahoma passed their reading exams in 2013-2014, compared to 66 percent of all third graders, according to state data. Josh, a 15-year-old home-schooled freshman living near Tulsa, said his math grades spiraled down as a homeless student. He is working with a math tutor and plans to attend public school next year. He is trying to avoid having to take remedial classes. The family has been homeless several times in the past few years after losing their house in the recession. They have stayed in extended-stay hotels, lived out of a van and moved into a home with another family before ending up in Oklahoma. Despite the turmoil, Josh said he remains focused on two goals. “I plan to be in a stable place for at least a year. That would be nice,” he said. “As for long term, this isn’t a plan — I will do it. I will finish my education. Immediately after high school, I will go to college. Part of the reason the counts of homeless students are rising is that schools are doing a better job of identifying those students, education officials said. But the population also is actually growing, they said. Carly Putnam, an analyst at the Oklahoma Policy Institute, a research and advocacy group, said an increase in homeless students and families indicates Oklahoma did not weather the recession as well as people believe. Oklahoma’s low unemployment rates can be deceiving because many residents work low-paying or part-time jobs, Putnam said. That makes it difficult to keep a family housed and fed. Rents also have climbed in recent years, she said. “Clearly, when people don’t have money to stay in their homes, the cost of living may not be as low as we think,” she said. Aliah Morales’ mother, Verna, now works at McDonald’s. She hopes to find a better job at a call center after she gets off probation later this year on a charge of failing to provide for a child. That could allow her and her daughter to move out of the shelter and into their own Habitat for Humanity home. Verna Morales has been homeless since getting divorced in 2009. She had moved to Texas but returned in 2012. In the meantime, her daughter and ex-husband had parted and the daughter was living with a sister. When Verna Morales was on her own, being homeless was less of a concern. “I got bigger and better plans for the future now,” Morales said. “I try to think about making it somewhere, getting a better job, stuff like that, so I can support her. Josh’s mother, Liz, is also struggling to find work, after being laid off. She said the pay for most jobs she finds is near minimum wage. Federal law requires districts to identify homeless students and provide them services. An example is transportation, which enables students to stay in the same school all year even if they move. Many counties and nonprofits also offer programs to help homeless youth remain in school or prepare for the workforce. Districts have to enroll a homeless student even if he or she is missing paperwork, whether proof of address, birth certificate or immunization records. This school year, Oklahoma received about $687,000 in federal funding for homeless student programs, down from about $733,000 in 2011. Ellis, of Putnam City Schools, said his district provides referral services to homeless students to connect them with organizations and resources that can assist. Aliah Morales is receiving help from Catholic Charities and another organization, but the long period of homelessness has taken a toll on her. Aliah and her mother said Aliah suffers from anxiety, post-traumatic stress disorder, separation disorder and bipolar disorder. She also has trouble sleeping. The Tulsa teenager laughed dryly when asked if there’s a connection between her mental health issues and being homeless. She said she also felt stigmatized and isolated at school. Oklahoma Watch is a nonprofit, nonpartisan journalism organization that produces in-depth and investigative content on a range of public-policy issues facing the state. For more Oklahoma Watch content, go to www.oklahomawatch.org.